Farm to Fork is an interesting app, especially for the Accidental Locavore. It’s British, which explains some of the quirks (and all the food terms I don’t understand). They’ve designed it to inspire you to cook from the gamut of British meats, in this case, lamb, pork, beef and chicken. With the exception of oxtail, there is no nose-to-tail eating, just recipes for the familiar parts. As with other recipe apps the Locavore has reviewed, this one also lacks a search engine. You choose an animal, then the part of the animal you want to cook, the app then comes up with a list of recipes using that cut of meat. The biggest category is for chicken breasts with fourteen recipes. The recipes are all rated from 1-4 forks, but there is no way of figuring out or adding to the reviews. 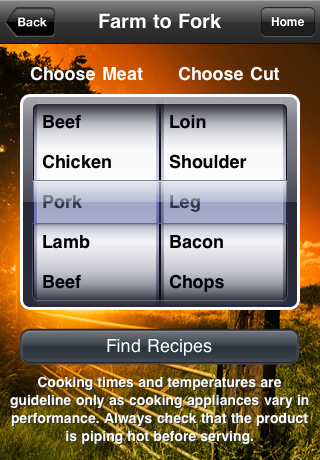 In fairness to the app, I haven’t actually cooked from any of the recipes. There are a lot of interesting ideas here, and with a little translation, probably some good food. I’d love to see an app like this for sustainable seafood that I could click on when say, wild salmon filets are on sale. Until then, I’ll use it for new ways to cook chicken breasts. Besides the recipes, there are “Farm Facts” such as “chickens are the newest living relatives to tyrannosaurus rex”, and an option called “Surprise Me” that picks a recipe for you. Minor quibbles: there’s not an iPad specific version, and you can only navigate if the phone is in a portrait position. After looking at it for a while on my iPad, I seemed to have lost the screen that tells you what each recipe is and how long it takes to prepare. Rating: 3.5 out of 5. This will stay on my phone for a while.